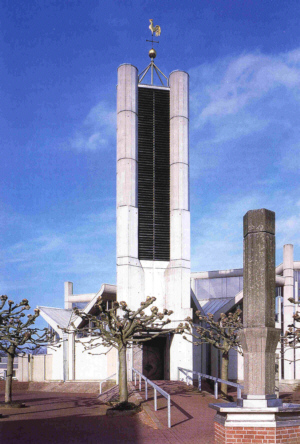 The German town of Emmerich provides a fine example of church architecture after Vatican II. In their building, the congregation wanted to apply the new freedom in a non-compromised and faithful spirit. After an international competition, they opted for a design by architect Georg Dieter Baumewerd from Münster. His proposal was fully contemporary, while also meeting the needs of the late 20th-century believer. 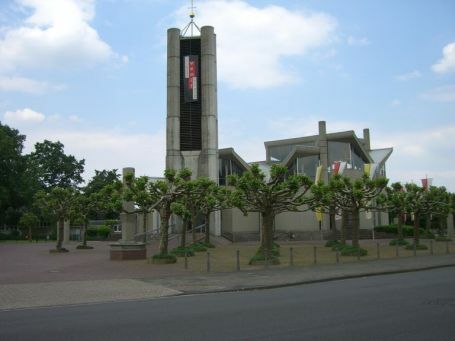 Situated along the Rhine on the border with the Netherlands, Emmerich seems a modest German provincial town. However, a quick topographical scan will make clear that the heartbeat of European history was always felt here. A visit to the Romanesque church of St. Martin on the bank of the Rhine underscores this sense of history, even though there is a remarkable amount of contemporary additions to the interior of this church. But the real treasure of Emmerich is the Church of the Holy Spirit, located in the new section of town called Leegmeer. This church was consecrated on Pentecost 1966. A plaza with plane trees separates the church from the road and softens the grey austerity of the concrete structure. Above the trees windows pop out that underline the open character of the church, counterbalancing the defensive quality of its massive walls. The jumble of compartments, roofs and pillars makes the building look capricious and elusive, while the uniformity of the concrete tower, fountain, pillars and poles that are placed all around the church provides the necessary unity. The roofs attract attention as they now look like wings, then like receiving hands or uplifted arms – a rich and meaningful element. 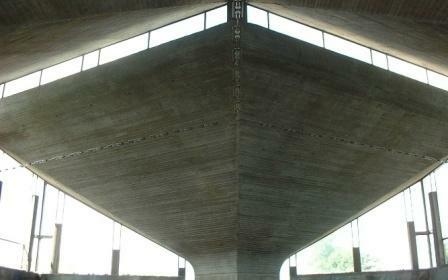 Upon entering one finds oneself underneath six mushroom roofs which divide the space in four sections (three equilateral triangles and one triangle in the middle). This gives the interior a decentralized look. Looking like open hands or foaming fountains, the main effect of these giant mushrooms is one of security: roofs under which one feels cosy and safe. In the middle of the church stands the altar, in accordance with the instructions of Vatican II divided into a Eucharistic Altar - a candelabra with vine branches in front of it - and a Word Altar combined with a small ciborium. The ciborium was crafted by Wilhelm Polder. The congregation, very appropriately, donated the silver. Sitting down to contemplate the effect of the building, one is confronted by the monumental murals that cover the walls from back to front. They are abstract, black, white and blue, the blue towards the front of the church becoming more dominant and intense, as if the blue of heaven increasingly conquers the darkness of sin. In six weeks Fred Thieler painted these 640 square meters of murals with his students. 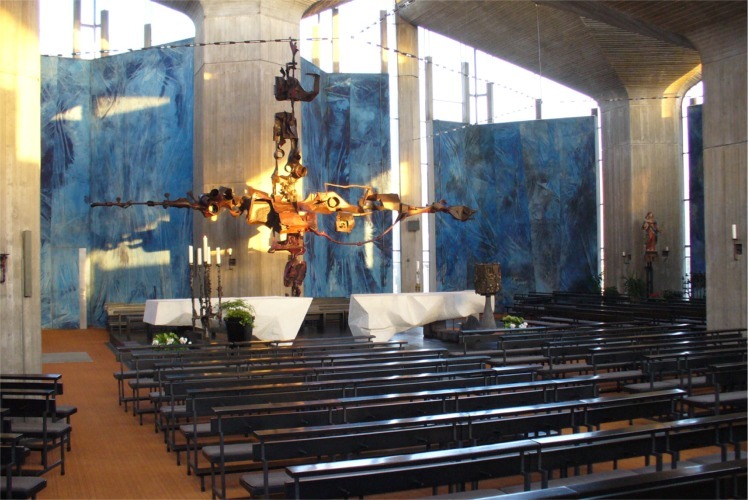 An extensive description of the church can be found on www.kirchenrundgang.heilig-geist-emmerich.de.